Jenni Ann Products was first established in Penrith in 1987, with the aim to manufacture quality custom lamp shades. The business commenced its humble beginnings in a 6 metre x 3 metre portable building at the rear of the family residence. The idea was borne out of family generations of lamp shade making experience and the need for Jenny to work at home while she raised her 3 children. The lamp shades became popular and in 1992 the business expanded into a high profile retail shopfront in Penrith and remained there until 1996. At which time the recession (we had to have) made it too difficult for the retail trade to spend any part of family income on decorative items such as lamps and lamp shades. A decision was then made to return the business to the backyard and focus on less depressed areas of our market until things improved. These days our business trades in a wider range of market sectors and is thereby somewhat insulated from isolated market downturns. E.g. small custom made orders from the general public, meeting the requirements of interior designers and curtain manufacturers and wholesale business in the supply of lamp shades to restaurants, hotels/motels, clubs etc. The backyard facilities have since been outgrown and the business recently moved to larger and more suitable premises in Wallacia just outside Penrith. Still we are pleased to offer friendly personalised service to the general public and maintain that ‘no order is too small’. The art of lamp shade making, passed on from generation to generation. Jenny first learned the craft of lamp shade making from her mother (Betty) and they worked together for several years in the early days of the establishment of the business. Jenny’s mother along with her own mother, learnt that craft from her auntie and uncle who had their own lampshade manufacturing business in the seaside town of Southend in the United Kingdom. Just after the war and only 15 at the time, she recalls sourcing scrap offcut silk and other fabrics from Lingerie workshops in the district. Clothing was rationed in those days and fabric was expensive and difficult to obtain. Believe it or not, many lampshades were manufactured from discarded parachute silk after the Second World War. An up market standard lamp shade in those days sold for around 4 pounds, which was a little under a week’s wages for many families. 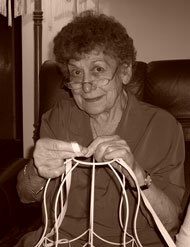 We estimate that Jenny and her family have been making lampshades for five generations, totalling almost 100 years. Obviously materials and techniques have improved since then, but the basic craft skills are still maintained. Sadly Jenny's mother passed away in October 2005 but the business continues to grow in her memory. Like history repeating itself, Jenny is training her own daughter Tiffany in the craft of Lampshade making and she now plays a significant role in the running of the business. They are both proud to be known by the nickname of ‘The Lampshade Ladies’. Jenni Ann Products is a privately owned Australian business and is committed to using Australian made products wherever possible. Received the lamp shades today and installed in my clients house. They look fantastic and we're very pleased. Thanks again for doing a great job and thanks for your craftsmanship."